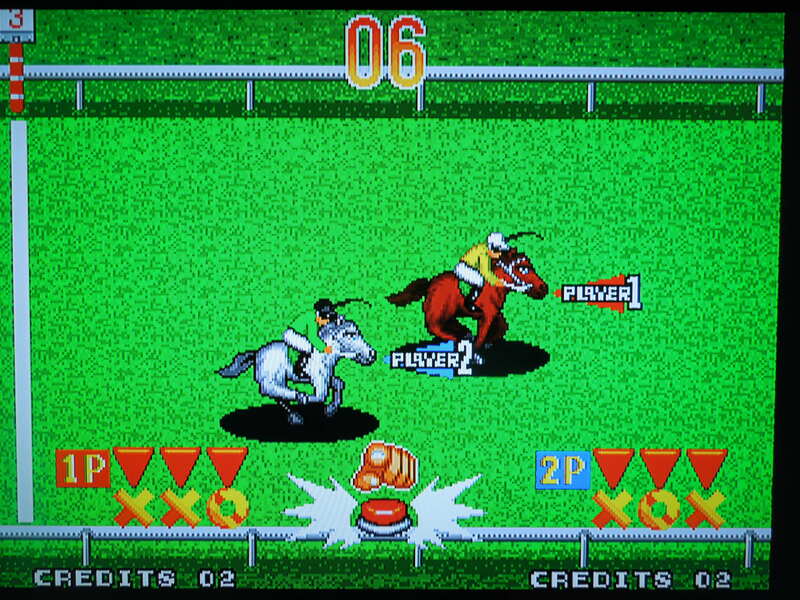 Quick History: Stakes Winner 2 is a horse-racing game released for the Neo Geo MVS (arcade) and the Neo Geo AES home console in 1996. It is the sequel to Stakes Winner. The AES home console cartridge didn’t receive a large production run, and it was only sold in Japan. The MVS arcade cartridge, however, was common in the U.S. and Japan. Today, MVS arcade cartridges can be converted into AES home console cartridges. 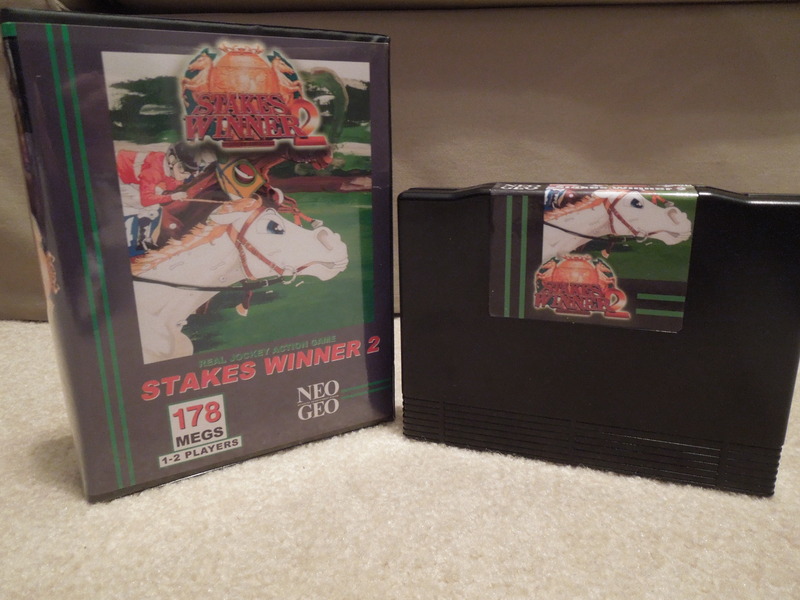 The Stakes Winner 2 used in this review was originally an MVS arcade cartridge, but was converted to an AES home console cartridge. 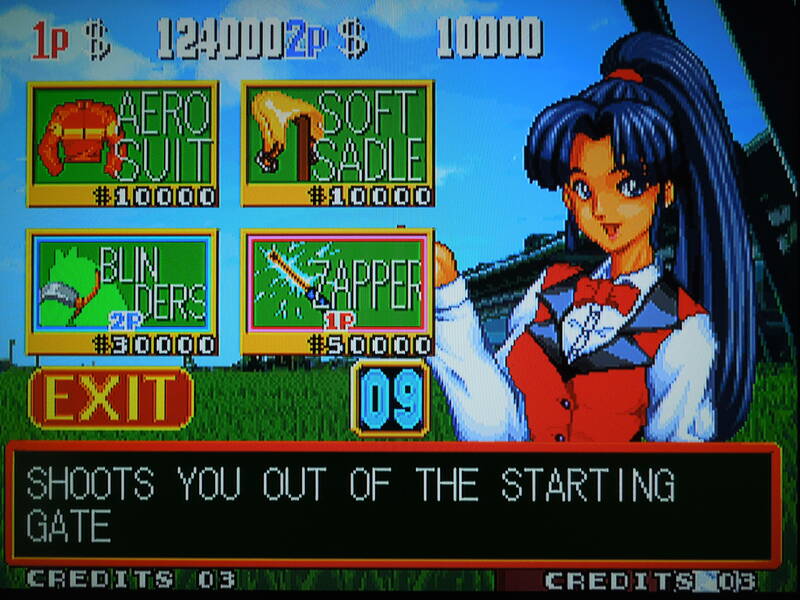 Stakes Winner 2 was released for the AES in short supply in 1996, but arcade cartridges can be converted into AES cartridges today. Neo Geo Memory Card Support? Yes. If you lose your 4 given Credits, you’ll be asked if you want to save the game. If you choose to save, you can start back at the last race you lost. Horses: Name your jockey (up to 4 characters) first. Next, pick your horse from among 12 colts and fillies: Local Hope, Ghost Story, Earthquake, Scent of Rose, Shine Dancer, Blue Angels, Open Heart, Black Bird, Quarter Back, Super Model, Triple Crown, and Dance Step. 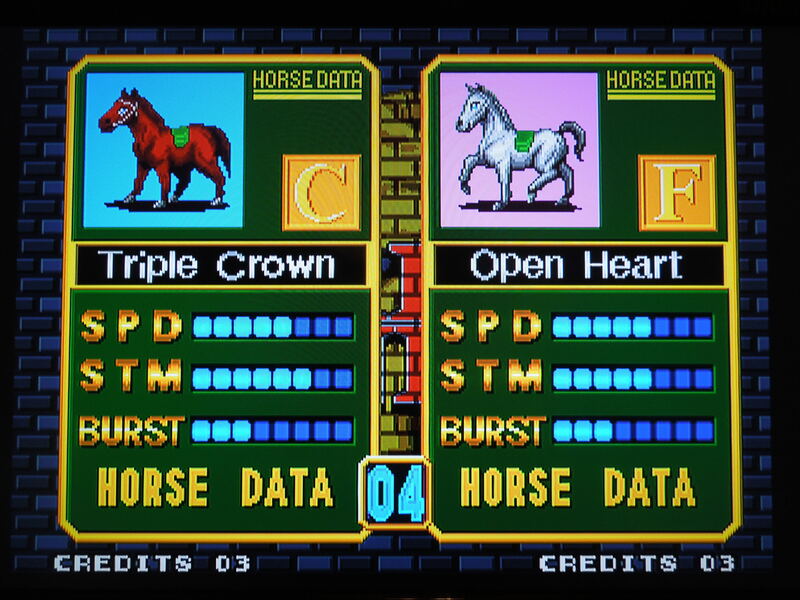 Each horse is rated in 3 categories: Speed, Stamina, and Burst. Control: Rapidly tapping A keeps your horse running at a steady clip, and slowly drains his or her health bar. B uses the whip, which makes your horse run even faster, but drains his health bar quickly. If you whip him too much, he’ll simply stop running altogether and you’ll be disqualified from the race (watch your horse’s ‘face’ logo at the bottom of the screen – if he’s shaking his head, stop whipping him). Button C is your ‘burst’ button. Essentially, at the end of the race, when your horse’s power bar is nearly depleted (and if you lose all your horse’s energy before reaching the finish line, you’ll lose), press C to kick in some extra health (this just means you’ll get a small portion of health restored to your horse’s health bar). Pressing Toward, Toward quickly on the joystick will cause your horse to ram other horses on the track, and will sometimes slow them down. However, if you do this 3 times (yellow ‘foul’ icons appear at the bottom of the screen), your prize money for winning a race will be cut in half. 12 different horses offer different strengths and weaknesses. 3. Grand Criterium 3. Breeder’s Cup Juv. 14. Prix de l’ Arc de Triomphe 14. Prix de l’ Arc de Tri. 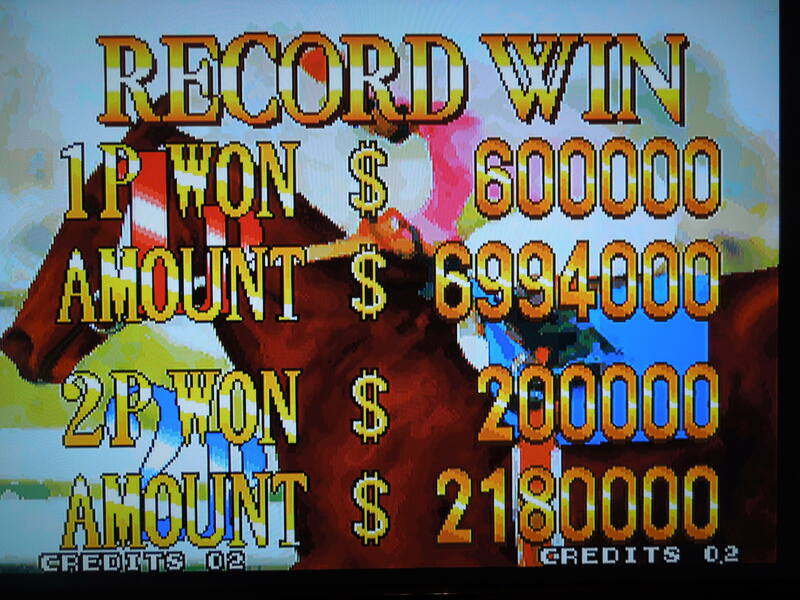 *Note: If you play Stakes Winner 2 on a Japanese Neo Geo AES or a European Neo Geo AES (or if you have a uniBios that allows you to change the internal region settings of your console), then races will be somewhat different from those listed above, as will the payouts for coming in 1st place. For example, if you play Stakes Winner 2 on an American Neo Geo, then the 3rd race on the Europe Mode will be the Grand Criterium with a payout of $200,000, as listed above. But if you play Stakes Winner 2 on a European Neo Geo, then the 3rd race on the Europe Mode will be the Prix Marcel Boussac with a payout of $160,000. Payouts/High Score: Some races offer large sums for finishing 1st (BC Classic – $1,560,000), while others have smaller sums (Prix de Salamandre – $80,000). The races in the America Mode, on average, pay more than the races on the Europe Mode. In addition to winning 1st place, if you set a new track record on each course, you’ll get an extra $100,000. Also, if you consistently win 1st place, you’ll get ‘Horse of the Year’ awards at certain points, and you’ll get more bonus money. Upon beating the game, you will get bonus money as well. If you don’t finish a race in either 1st, 2nd, or 3rd place, you’ll have to try the race again (if you have any Credits left). Winning 1st place and breaking track records pays big (most of the time). Helpful and Harmful Items on the Track: 4 icons appear on the track in certain locations: Carrot (adds a small amount to your horse’s health bar), Wings (gives your horse a very helpful, temporary, speed boost), Mole (slows your horse down for 2-3 seconds), Poison (‘paralyzes’ your horse for 4-5 seconds). Although the locations are always the same, what icon will appear can change every time you play a race. Unfortunately, because your horse is running so fast, it is usually nearly impossible to avoid hitting these icons if you’re in position to run over them – so, what that means is, it’s a complete gamble whether you will pick up a Carrot or a Mole – you don’t have time to get your horse out of the way if you notice you’re about to hit a Mole. However, a way to circumvent this problem is to simply learn where icons typically appear on a track (usually at the end of a long stretch) and have your horse on the opposite side of the track. You don’t need extra Carrots and Wings to dominate the game, although they don’t hurt, either. Hammer the B button in the home stretch to make your horse turn it on. Stable Shop: Between races, you will have the option to buy items that will help you for the upcoming race. Several items are available for purchase, but here are the most crucial ones – these can be the difference between placing in the top 3 or not: Carrot-minis (adds one last portion of health to your horse’s health bar, even after you use up your Burst health portion) and Horse Shoes (grips that are only available for purchase if it’s raining on the track – they allow your horse to continue running at a good rate without getting bogged down. Carrot-minis start out at $50,000. Horse shoes start out at $30,000. You are only allowed to buy one item per each visit to the Stable Shop, and items you have purchased previously increase by $5,000 when you return. The stable shop items can be expensive, but depending on the race coming up, helpful. Horse and Jockey Training: 4 times between the American Mode races, and 2 times between the Europe Mode races, you can ‘train’ your horse in one of 3 areas: Turf (Speed), Dirt (Burst), Pool (Stamina). After you select your course, you have 30 seconds to guide your horse through a small obstacle course. It’s easy to complete in under 30 seconds, and your horse’s stats will be boosted afterwards. Additionally, there is an optional ‘Jockey Training’ selection. Jockey Training involves you paying a large sum of money for a ‘special’ move for your horse. For example, ‘Extra Push’ is available for $150,000 (and that’s the cheapest special move). These special moves require you to input particular joystick motions during races – in my experience, these special moves are not worth the money, nor do you need them to dominate races. Training your horse will boost his stats for upcoming races. Rivals: In 1 Player Mode, ‘rivals’ will occasionally turn up and badmouth you right before a race. In order to get a rival to show up, you’ll have to constantly win races while setting new course times. If you beat a rival, he’ll then teach you a ‘special move,’ like the ones you can buy from the Jockey Training session, but they’ll be free! 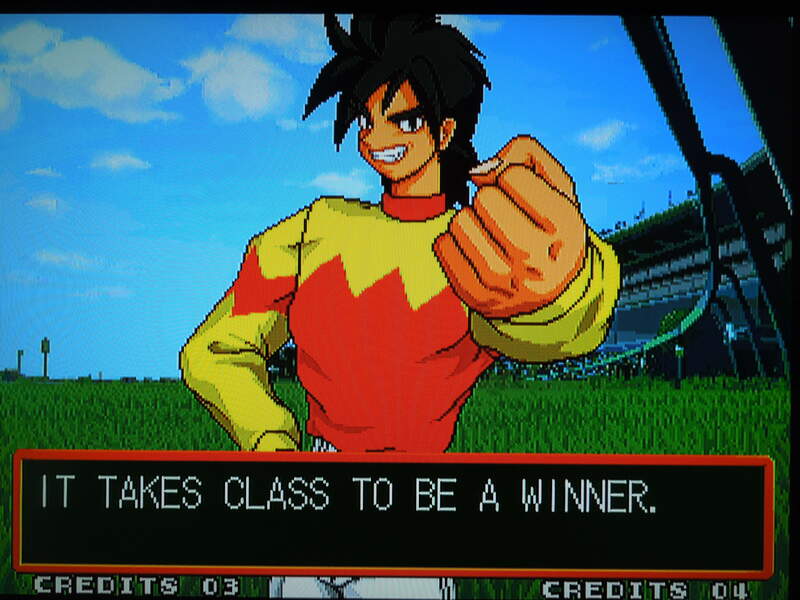 The easiest rival to get to appear is Dan, a jerk who typically appears before the 16th race and reminds you that “It takes class to win.” Rivals do not seem to appear at all in 2 player mode. World Cup Race: I have not confirmed if this exists on America Mode, but on Europe Mode, if you win all 16 races while setting new course records in all of them, a 17th race, the World Cup, will be available to you. Its payout for 1st place is $2,400,000 – the highest payout in the game. 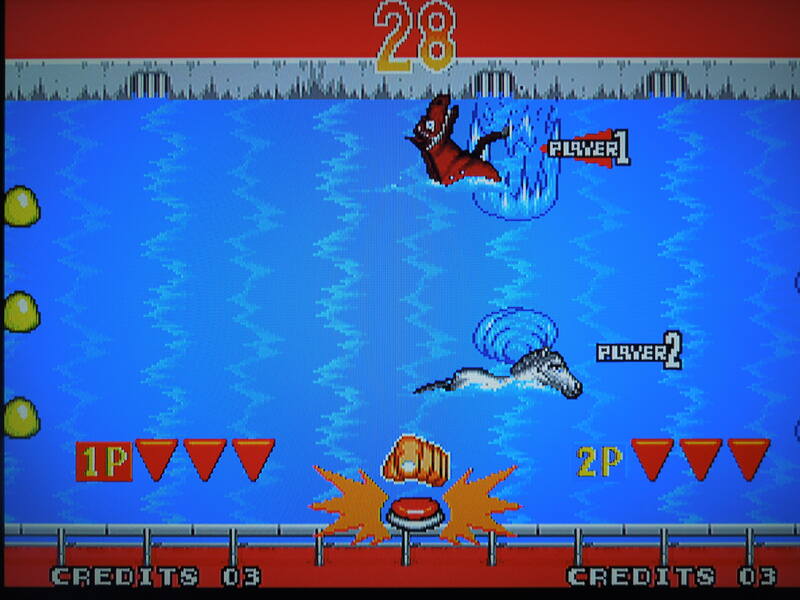 2 Player Mode: In two player mode, since there is no split-screen, if one player gets far ahead, the other player will be automatically pulled close behind him, so that both players are always visible on the screen at the same time. It sounds funny, but it works well, particularly if one player is experienced and the other isn’t. 2 Players can play through the game together, each with 4 Credits each. Improvements over the original Stakes Winner: The game plays faster than the original – this time it’s a really fast-paced racing game. There are far more races in Stakes Winner 2 than the original Stakes Winner, more horses to select from, and more ways to earn money/increase your high score. Buying items is an interesting improvement. Regression from the original Stakes Winner: In Stakes Winner 2, it’s practically impossible to avoid icons on the track that you don’t want (like Poision) IF your horse is running in the lane in which the icons appear. In the original Stakes Winner, you had time to see the item coming, and either move to pick it up or move to avoid it. In Stakes Winner 2, the “ramming move” is not nearly as effective as it was in the original Stakes Winner. In 2, the move doesn’t slow down other horses nearly as much as it did in the original. 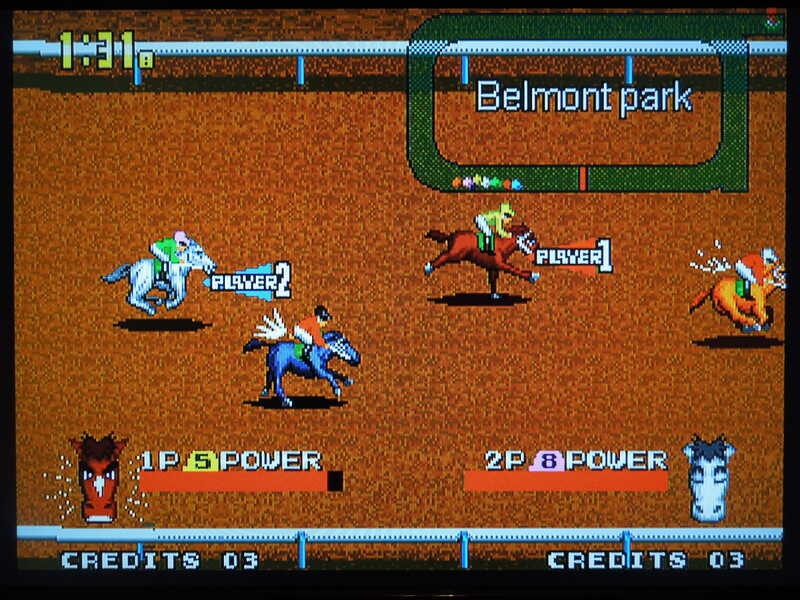 Last, the horses (graphics) were larger in the original game – they’ve been shrunken down a bit for 2. How may other video games give you a chance to participate in event that’s been happening every year since 1875? So, where can I find this game? Since it was only originally only released for the Neo Geo AES in Japan, and in small numbers, it’s tough to locate an original. The MVS arcade cartridge is very common, however, and easy to find – you can always get an AES conversion like the one I used for this review. Stakes Winner 2 was also released for the Sega Saturn, only in Japan. That version does have an English language option that changes most of the language in the game to English. 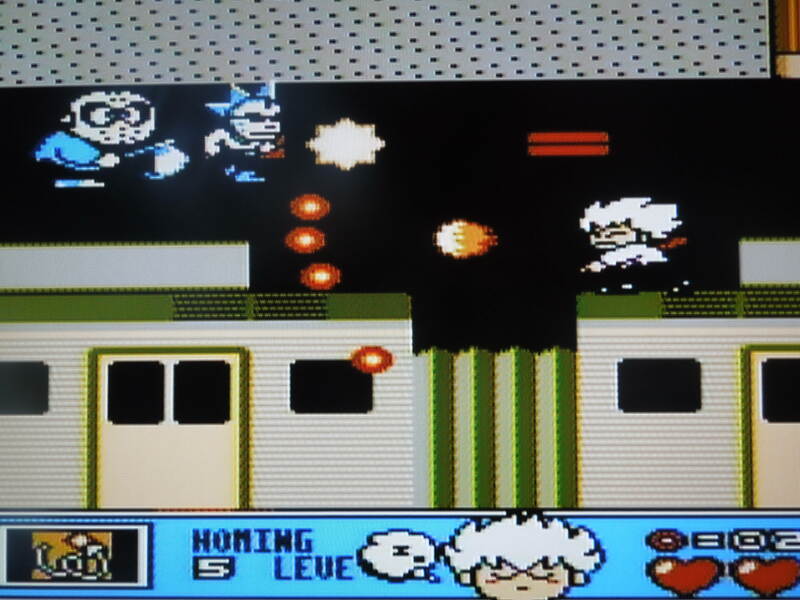 You can play the rom on a computer emulator. 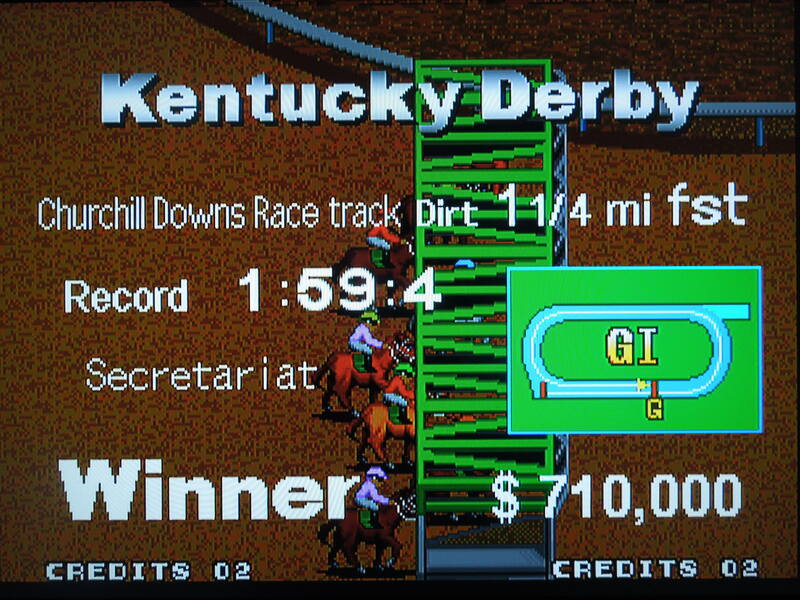 Conclusion: Stakes Winner 2 is an enjoyable racing game. When we think of racing games, ‘horses’ aren’t something that typical American gamers think of, but that’s a shame, because this game, like its predecessor, is addictive. It’s not difficult to win races, even on Hard Mode, and trying to beat your high score is great fun. You’ll find yourself weighing your options – “The Carrot-minis cost $50,000 – do I really need them to finish this race?” My current high score is $17,624,000 using Super Model on the America Mode (Hard). Is this game better than the original? Yes, slightly – although the first Stakes Winner was quite good too in my opinion. 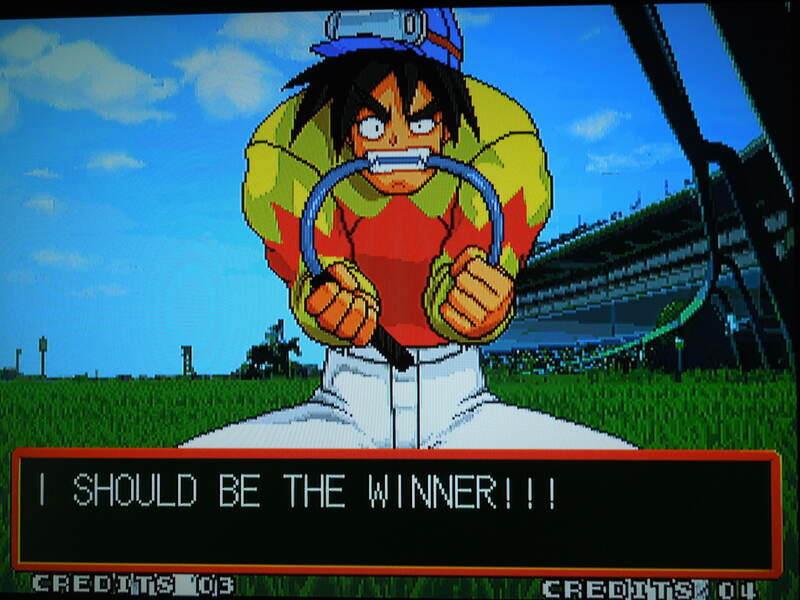 This entry was posted in Neo Geo - Stakes Winner 2 and tagged Stakes Winner 2 Neo Geo Review. Bookmark the permalink.